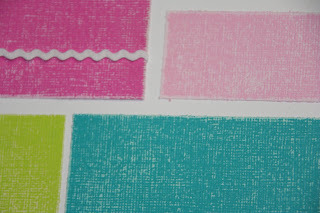 Remember that great textured cardstock sale we just had? Well, I have cooked up some artwork using that textured cardstock. 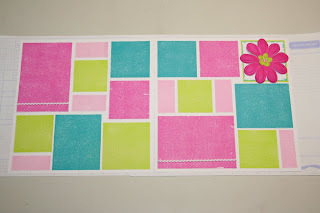 If you purchased from me, you were invited to a free workshop to bring your new cardstock and create. Today I will show you the layout we will be creating on Saturday. I also used some Paper Flowers. They started out white, but I dyed them to match my papers. How did I do that, you ask? Well it's easy! Just use a little spray bottle (like the kind our spritz stamp cleaner comes in) and put a little bit of rubbing alcohol in it. Then add some re-inker (as much as desired to get the color intensity you desire). Give it a little shake and then spray it on your flower. It really doesn't take too long to dry, either. By the time you get your layout all put together with all the sanding and such, it will be good to go-unless you are really fast, then you are going to have to leave it sit a little longer! :) You can look back at a couple of other dyed paper flowers here and here. I have used the sanding technique on the textured cardstock. Here is a close up of that so you can see it better. I love to do this as it really makes the texture pop! Join me tomorrow for a look at the cards I created, too. I love these colors. I am visualizing Easter pictures or some April Birthday Party pictures! Good job on this layout!